If your Aspire tank is broken or smashed, we can bet that you’re looking for a low-cost solution to repair it, right? Here at Official Aspire, we are an official distributor of Aspire hardware, including the Aspire Replacement Glass. As with all of the products that we supply, the replacement glass is made to the highest quality possible and is priced suitably for an array of budget requirements, allowing you to get the most out of your products. We supply the Aspire Replacement Glass to provide you with a quick and easy fix, allowing you to continue using your high-quality vaping products from Aspire! All Aspire Replacement Glass that we have in stock is compliant with TPD Regulations and allows you to maintain the quality and performance of your device. Our Aspire Replacement Glass is designed to suit some of the most popular Aspire tanks and is part of an up to date collection, that is considered to be revolutionary. 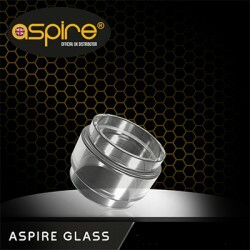 All Aspire Replacement Glass is 100% genuine and authentic, providing you with exceptional value for your money. At Official Aspire, we have a complete range of spare parts and accessories available for Aspire devices, including the Aspire Cleito and Aspire PockeX, - preventing the need for you to buy a brand-new device. When it comes to fitting the Aspire Replacement Glass, the process is simple because it’s designed to fit perfectly into the original unit. Whichever tank you own, if you need replacement glass,we are confident that you’ll find something suitable from the extensive collection of products below. Having dedicated this section to Aspire Replacement Glass for the Aspire Nautilus, Aspire PockeX, Aspire Cleito and many more, we aim to make it easier for you to find what you need. If, for whatever reason, you cannot find what you’re looking for or if you need to know more about the Aspire Replacement Glass, please contact our support team who is always on hand to help! Cleito Pro Replacement Glass. Replacement glass needed for the Cleito Pro ? No problem, the Cl.. Aspire Cleito 120 Replacement Glass The official replacement glass for the Aspire Cleito 120. .. Aspire Cleito 3.5ml Glass The Aspire Cleito is fast becoming another legendary prroduct from Aspi.. Aspire Cleito 5ml (Fat boy) Glass The Aspire Cleito is fast becoming another legendary prroduct f..
Cleito 120 5ml FAT BOY Ok so we released the Cleito 120, then the RTA section and the public dema..
Cleito 120 Pro Bubble Glass The long awaited Bubble Glass (Fat Boy) for the Cleito 120 Pro tank i..
Cleito Pro Fat Boy Glass. Replacement glass needed for the Cleito Pro ? No problem, the Cleito..
Nautilus 2 Replacement Glass Broken your glass on the Nautilus 2? No problem Aspire has you cover.. Aspire Atlantis Evo 4ml Adapter If you have purchased the EVO 75 kit and would love a little extr.. Aspire Mini Nautilus Glass Replacement glass for the Mini Nautilus. Easily fits onto the Mini .. Aspire Atlantis Glass Replacement glass for the Aspire Atlantis. Easily fits onto the Atlantis..